Demolition of two Oregonian publishing buildings with new construction on both parcels. PHB project: Affordable housing development consisting of approximately 162 units divided across three 4-story buildings. Limited amenities on site including a community room, laundry, surface parking and a playground. No retail. All storm water addressed on site. 2 development projects – in CM zone Mixed use commercial retail development with parking and in the R1a zone six unit residential development with 9 parking spaces proposed. Looking to meet community design standards. Demo house. Construct a new 3-story apartment building. Plans to meet community design standards. This EA is really to find out if PBOT will require a ROW dedication, and if so, what size. Proposal is for Comprehensive Plan Amendment to urban commercial and zone change to CS (storefront commercial). See LU 16-185068 for the design component of this review. 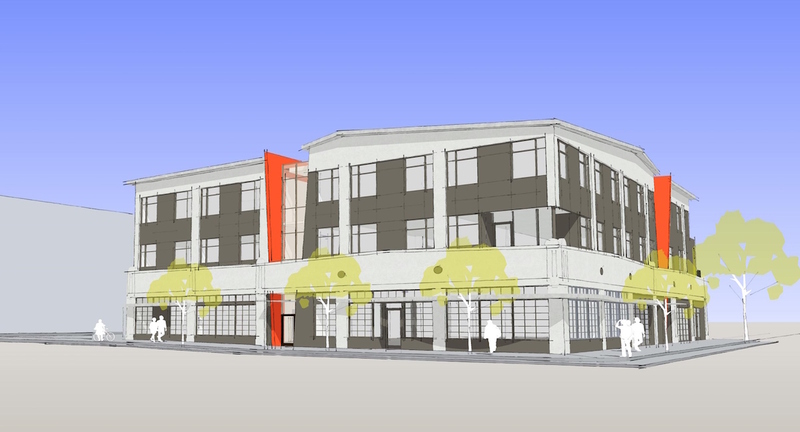 Proposal is for a plan amendment to urban commercial and zone change to CS (storefront commercial); phase 2 Design Review for 3rd floor addition to existing YMCA building. This case folder is for the design phase only. For the plan amendment and zoning change see LU-16-186417 CP ZC. Construction of a new 6-story multi-residential building with 17 units. New 3 story apartment building with 6 units, site improvements, drywell, detached trash enclosure less than 120 sq ft. Partial change of occuancy and 2 story addition of 16,658 sq. ft. to existing single story concrete building. Complete structural upgrade to 2010 OSSC. Shell permit. Separate tenant improvement permits required. Trade permits separate. Appeal for live/work unit. This entry was posted in 1313 SE Lambert, 2815 SW Barbur, 5010 N Maryland, 8015 N Oswego, 8080 SE 6th, Ankrom Moisan, Edge Development, GBD Architects, Metro Reports, Press Blocks, SE 93rd & Woodstock, Stark I & II, The Geode. Bookmark the permalink. The project at 1313 SE Lambert St seems surprising; it goes against the step-down-from-the-main-street philosophy. There aren’t any 4-story buildings anywhere near this site. I’m all for good density, but that site isn’t even on the main drag – it will really tower compared to its surroundings, especially being on the side street. 1313 SE Lambert will, I believe, face on SE 13th, which is a Neighborhood Collector Street. Not a major arterial, but a minor commercial street. It could be considered a Neighborhood “main street”. You’re right. The 1313 building is facing Lambert, not 13th. This only makes sense when you look at the zoning map, and see that the commercial zone extends back to include this lot. This makes the commercial zoning boundary a consistent distance from the Neighborhood Collector of 13th Ave. If the building west of it were also 4 stories, it would be more consistent. And maybe one day it will be. But for now, this odd pattern will emerge. A similar thing is happening at 2515 SE 41st, a 50 x 100 lot south of Division, that is also the last commercial lot before the R-2.5/R-5 zoning starts.